A superb full-frame compact camera for those who like traditional controls and modern features like an electronic viewfinder. The Q is capable of producing beautiful quality images. Of course there's a downside too. Often most notably, full-frame cameras tend to be much more expensive than smaller format models because the sensor is usually the most expensive component. As well as taking up more space, the large sensor also requires a bigger lens to produce a large enough image circle and naturally this adds up to making the camera larger – although manufacturers, most notably Sony, are managing to shrink cameras all the time. Despite their high price, Sony's RX1 and RX1R have been quite popular amongst professional photographers who want a compact camera that delivers top-notch results. The new Leica Q looks set to entice a similar audience as well as well-heeled enthusiasts with a love of photographic traditions. We were sent a full production sample Q before its launch, so we've been able to put it through its paces for this review. Leica has a long history and a reputation for making high quality cameras and lenses along traditional lines. A working agreement with Panasonic means that some of Leica's compact cameras are made in Panasonic's factory using the same components as Panasonic's own cameras. The Panasonic LX100 and Leica D-Lux (Typ 109) are prime examples. 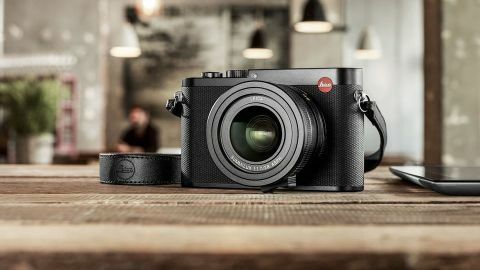 The Q (Typ 116), however, is made in one of Leica's German factories and although it has traditional controls and looks like a slightly miniaturised M, it has a few modern features like touch-screen control, autofocusing and an electronic viewfinder (EVF). The Leica Q is very reminiscent of Leica's M cameras, but there are technical differences. As mentioned earlier, the camera is based around a full-frame (24 x 36mm) CMOS sensor with 24.2 million effective pixels, to boost detail resolution this sensor has no optical low pass filter. There's also a Leica Maestro II processing engine like the one in Leica's medium format camera, that has been specially adapted for use in the Q and a Leica Summilux 28 mm f/1.7 ASPH lens, which makes a good 'walkabout' lens with plenty of scope for restricting depth of field. Although this is a fixed focal length lens there are digital zoom settings equivalent to 35mm and 50mm, which reduce image size to 15.4 and 7.5MP respectively. Sensitivity may be set from ISO 100 to 50,000, with an automatic setting to put the camera in control and there's a maximum continuous shooting rate of up to 10fps (frames per second) at full resolution. Images can be composed on the rear screen, but the Leica Q also has an electronic viewfinder. Leica M cameras are manual focus only, but Leica claims that the Q has the fastest autofocus system in its class – so faster than the Sony RX1 - with a claimed response time of 0.15sec. There's also a Macro setting to reduce the minimum focus distance from 30cm to 17cm. Manual focusing is also possible using the dedicated lens ring. Image may be composed and reviewed on either the 3-inch 1,040,000-dot touch-screen or the 3,680,000-dot electronic viewfinder (EVF). This is the highest resolution EVF around and it gives the Q a significant advantage over the Sony RX1 and RX1R as they don't have viewfinders. The Leica Q has a digital zoom function which replicates the effect of longer focal length lenses – though the image size is reduced. Other modern features of the Q include the ability to record MP4 Full-HD video at 30 or 60fps with stereo sound via the built-in mic, optical image stabilisation for still and video and both Wi-Fi and NFC (near Field Communication) connectivity to allow remote control by a smartphone or tablet as well as image sharing using Leica's free Q app. In addition, the mechanical shutter allows shutter speeds up to 1/2000sec but the electric shutter extends the range to 1/16000 sec.